Surprise! Welcome to Flip 6! I’m not a very good blogger…I took another unintended blogging hiatus. This time for a month! Don’t mistake my silence, however, for inaction. It’s the exact opposite. I have been swamped. All kinds of swamped. Work has been unbelievably busy– no complaints about that! I’ve been trucking along on Flip 5. But I also had a little surprise drop in my lap too! I tackled my latest project: Flip 6. I was not even really looking for another project since I’m knee deep in Flip 5, but I was also quite curious about wholesale home buying and reselling…and that’s how I discovered Flip 6. Flip 6 was not on the open market. Instead, I purchased this home via an auction at the county courthouse. Currently, in my market, it’s getting more and more difficult to find investment properties on the open market because I have to compete with home buyers that are desperate for homes. By purchasing via a foreclosure auction, those home buyers are mostly eliminated. The reason that most buyers are eliminated in buying a house at auction is that unlike the typical home purchase, the buyer must pay cash immediately. You can’t go to the bank, get a conventional loan, have an appraisal done, negotiate repairs, etc. It’s literally an immediate cash transaction on a sight unseen property. That intense risk and the necessity for cash eliminate the majority of buyers..which, for an investor like me, is what you want. This is the riskiest purchase I’ve made yet. It was a property that I knew nothing about. I didn’t get to have an inspection, I didn’t have access to a disclosure, I wasn’t sure of the condition…but I knew the market. And the market said, if purchased at the right price, I could make money on this house. Being a foreclosure, it was obviously going to need some work. But as blind purchases go, I could have had it worse. Of course, I was inheriting someone else’s problems with this house, but luckily, the problems were minimal. I had more problems (and more costly) at Flip 4 than this house. This house really just needed a good dose of paint and some cosmetic upgrades. Despite the extreme filth and neglect, what appealed to me about this property was its location and the 4th bedroom. There is a flood of 3 bedroom homes on the market, but many growing families are looking for that 4th bedroom. It was going to be my job to make the filth disappear and restore its charm. And I had a VERY tight deadline. 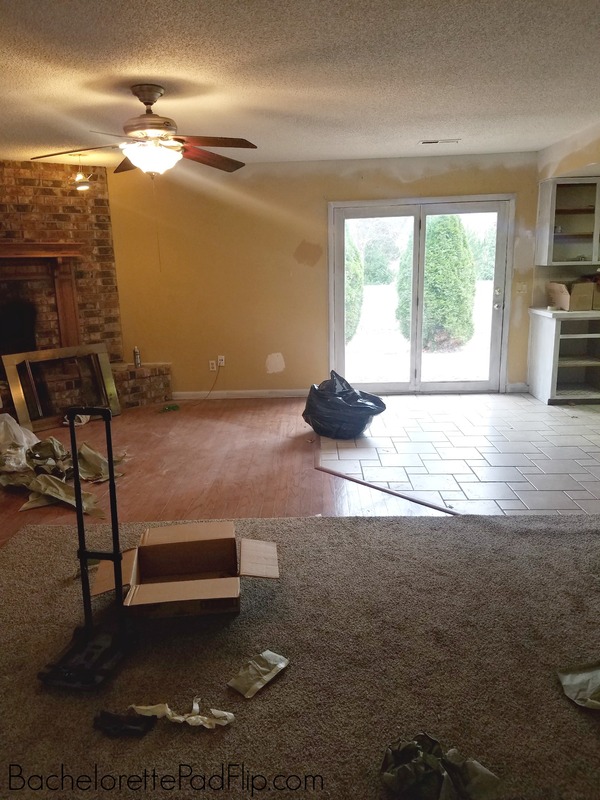 My original goal when buying this house at auction was to turn around and sell it as a fixer upper to another investor…without touching a thing. But, once I was able to get in and really evaluate what needed to be done, I knew I could knock out the upgrades for next to nothing and list for much more than I had original intended to do. So without meaning to, I purchased another flip house. 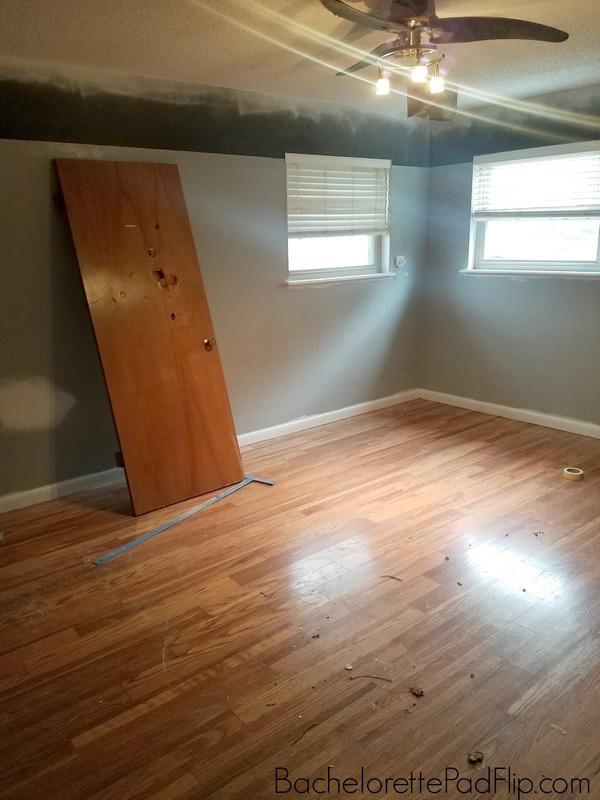 With the exception of the master bedroom, none of the house needed flooring. 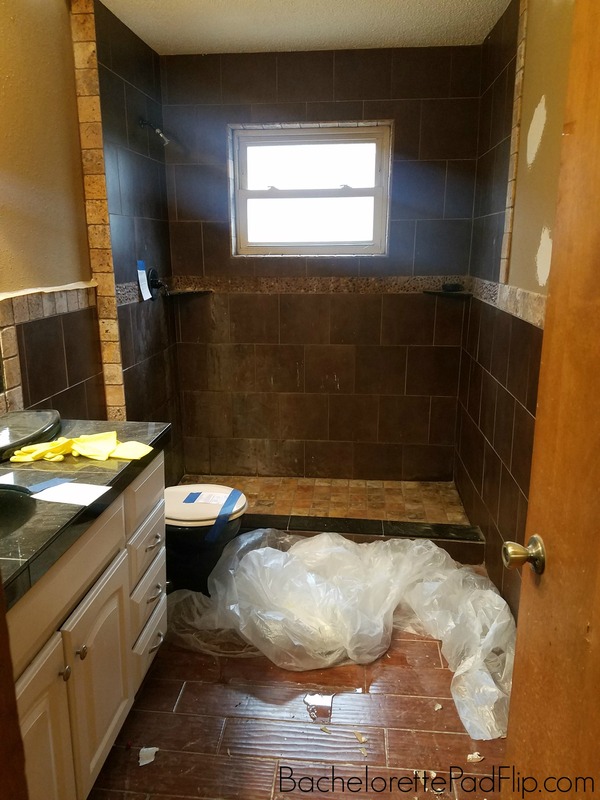 There was tile, hardwoods and laminate throughout that were all in salvageable condition. The master bedroom had DISGUSTING carpet in it. 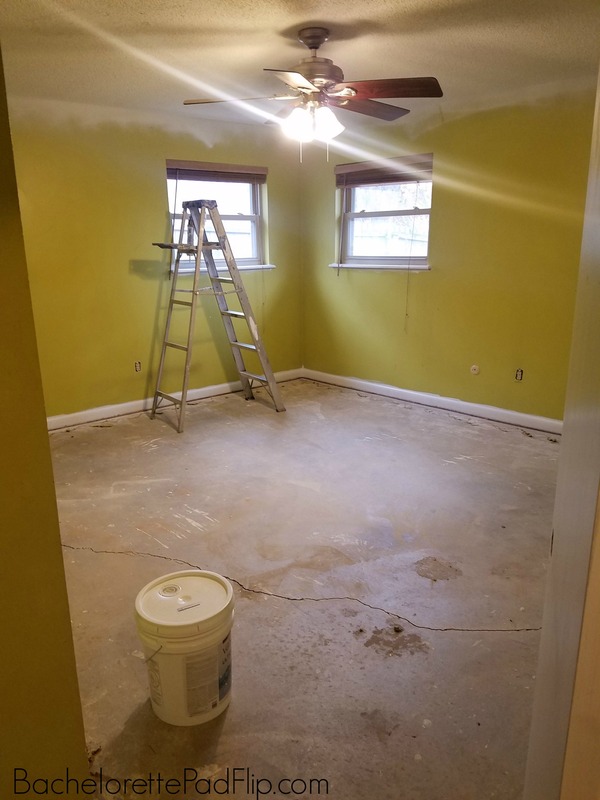 And only two of the bedrooms needed paint. 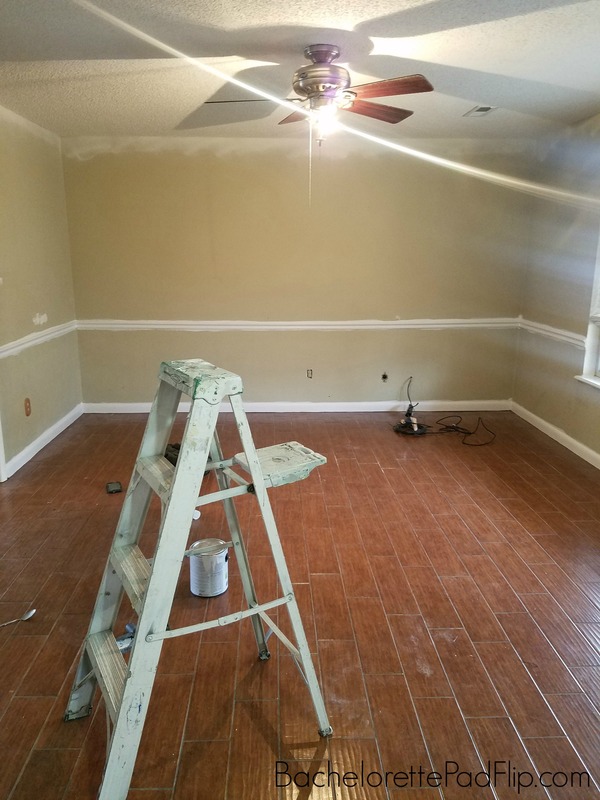 I’ve mentioned before how much I love my painter, but since my budget was so, so tight on this house, I chose not to hire my painter to paint the house (except for painting the ceiling and trim and cabinets). With it being almost 2,200 square feet, I quickly realized I never want to have to paint a flip house myself! This house had a lot of things going for it, but over the course of years, it had taken a beating. Literally. 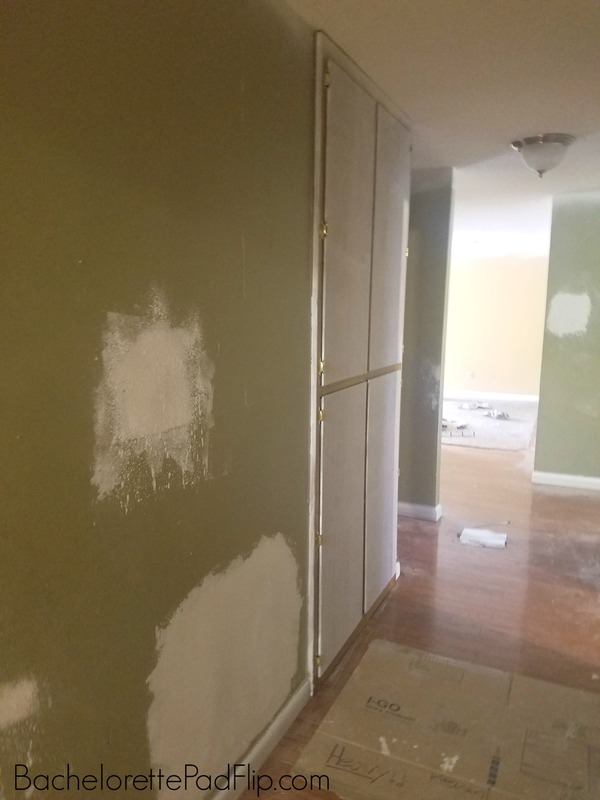 Ever single interior bedroom door had to be replaced because fists had gone through the hollow doors. The showers hadn’t been cleaned probably since Y2K. But those are all easy fixes, and I knew those easy fixes could bring money! There was a lot of trash, debris, furniture, clothes…you name it…left at the house. That’s the byproduct of buying foreclosures. It could have been worse however. I’ve seen houses where you can’t even walk because of the debris and trash, so, comparatively speaking, this wasn’t a huge clean up mess. But just getting all the crap out would greatly improve the appearance of the house. After dong my review on Bagster, I decided that wasn’t the way to go for clean up. So we moved our trailer to the house and decided to fill it up and take to the dump each time. The kitchen was really in good shaping. Sure, the stove was busted and the vent hood had seen better days, but there wasn’t anything significantly wrong. It was dated of course, but that’s always an easy fix. The tile floors were in good shape, but they were in desperate need of some deep cleaning. Eventually I learned the tile backsplash wasn’t going to work, so that was really my only surprise in the kitchen. 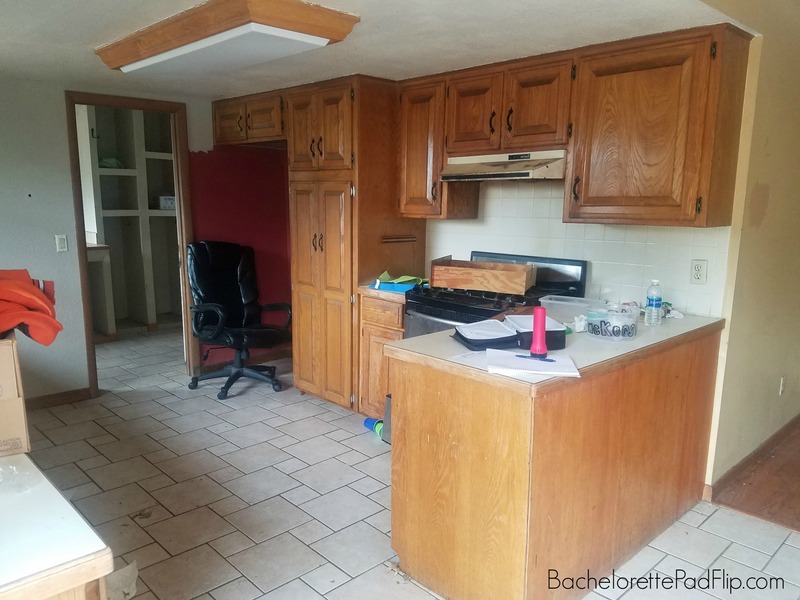 I’m always glad when there’s real wood cabinets, and the laminate countertop was in good enough shape and a good neutral that I knew I could keep it. I also liked that the room was already open concept with the living room, so refreshing this room was going to be pretty easy and quick. Since I hadn’t planned on flipping this house when I bought it, I had to come up with a design plan overnight. 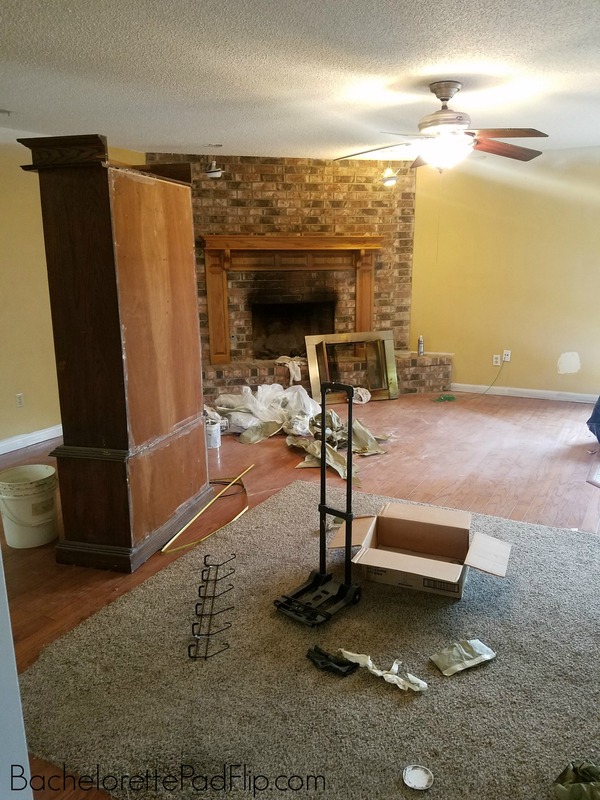 We started work immediately, and I wasn’t able to get true before pictures because we didn’t have utilities on yet. Those patches were actually huge holes in the wall (the bottom one was big enough for a body). 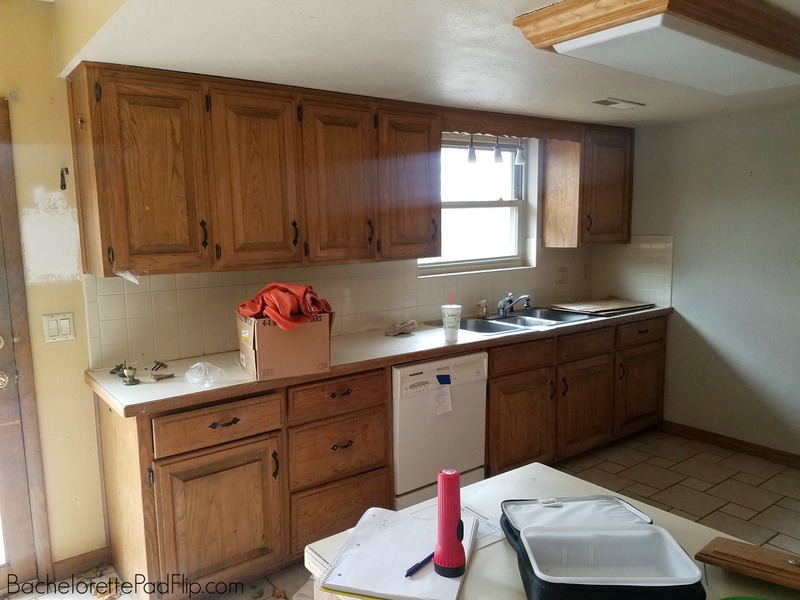 The cabinets and trim were wood stain that had seen better days. Just freshening those up and repairing the holes, it made a huge difference! There was virtually no curb appeal. 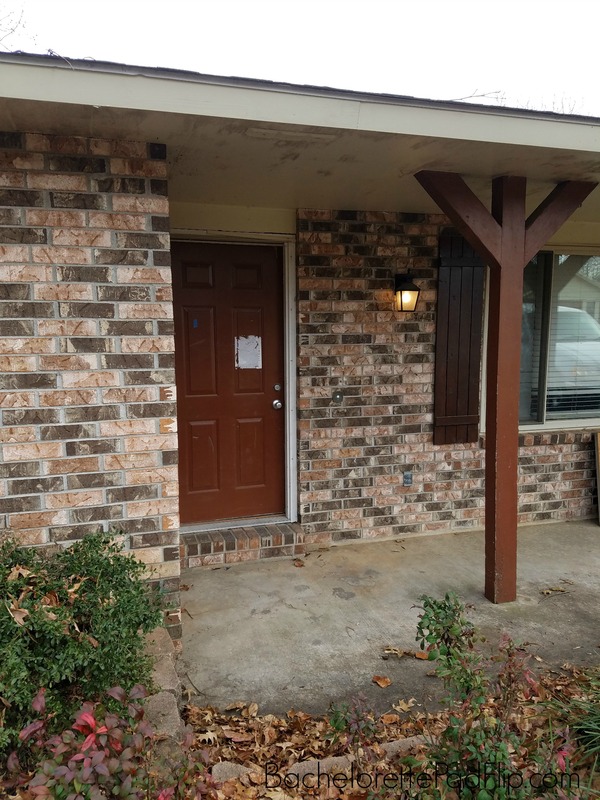 Between the filthy porch, the thousands of leaves, and foreclosure warnings taped to the door, it was not a very welcoming home. Tackling curb appeal though is typically a fairly easy job. This house had good bones inside and out…it just needed help showing it off! One of the neighbors told us that their friends had peeked in the windows because they were thinking about bidding on it at auction too but they were scared off by my so much work. And here I am thinking (and rejoicing) how little work had to be done. Some paint and fixtures and it’ll be ready to go. I hope you’re following me on Instagram because I keep everyone way more updated than I do on my blog. If you follow me on Instagram, then you know I’ve already finished this house and it’s on the market. I’ll be spending the changes through several blog posts over the new few weeks. So did you get that felling? that thrill feeling at the sale? I love buying at the Sheriff Sale, Looks like a fun one that just needs clean up, Have fun with it!!! Girl I sure wish I had your know how and half your energy. You always seem to know just what you are going to do and they look great, 5 & 6 will be no different they will look fabulous and sell fast, money in your pocket right? Load More…Follow Bachelorette Pad Flip on Insta!